Everyday I hear the same old story…the real estate market is tanking, buyers are scared to buy, bla-bla-bla. Even though us real estate agents scream to the roof tops that housing markets are local, the media negativity drowns the truth out. The only thing we do know is that the number of foreclosures has increased and so the perception is that the Twin Cities real estate market is going down, down, down. Luckily, some savvy people at the Minneapolis Association of Realtors have created a new report that better outlines what is really happening here in Minneapolis. Some say that statistics don’t line. However, statistics themselves can be a problem if they don’t take special circumstances into account. Case in point, all the stats that come in for the Twin Cities includes data from both foreclosures, short sales, and traditional sellers, saying that median home prices have fallen 10.3% in the last year. 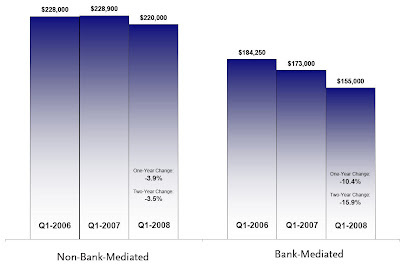 If you were to separate the two bank related sales from traditional sales, you would have a very different look for our local real estate market. Home sales NOT related to foreclosures or short sales are actually only down 3.9% from this same time a year ago in 2007. Yes, foreclosures do effect the market, but sellers not facing foreclosure can now look at real information that shows the future is not as bleak as the media paints it. The same goes for buyers. While the national media might be reporting the sky falling, sellers are not giving away homes as you might like. There are good deals to be had, but if you want a steal, the best bet might be too look at a foreclosure. You can read more of the report at the link above, which also has a break down of foreclosures by price range and housing type.